Women’s black track jacket with a matte finish from Y-3. 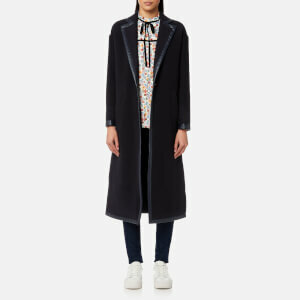 Made in collaboration between adidas and Japanese fashion designer, Yohji Yamamoto, the long jacket is crafted from a cotton jersey blend with a loose cut. 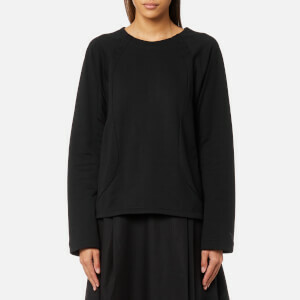 Fastened with a two-way zip closure, the loose fit jacket is detailed with a scarf-like fabric around the ribbed collar, zipped vents to the sleeves and side slit pockets. 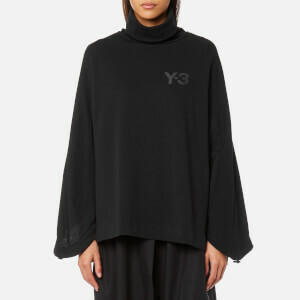 Complete with long ribbed trims, signature three stripe detail to the back of the collar and a tonal printed Y-3 logo to the left sleeve.